If cute and quirky stationery is your kind of thing, then stock up on The Station Box’s collection of hand-stitched notebooks, planners, and thank you cards. We all love stationery; some for the sheer practicality while others for their novelty in this digital era. Balancing both and making you put your money on quirky and simply stationery is The Station Box. Notebooks, pocketbooks, to-do list pads, and thank you cards are what the collection consists of. Everything’s handcrafted and ready to be used to with your ink pen or glitter pen (don’t tell us that you don’t use one), so come boring meetings or lectures at college, you have a fun notebook to doodle (or take notes). The weekly planner cards are something we dig. We are going to order ourselves a set and start handing out to everyone in the team. Nothing like a handwritten weekly planner to show your boss how dedicated you are to your work. For self-confessed stationery addicts, the brand’s collection of hand-stitched pocketbooks and to-do lists are something that they will want in their pockets and desks. Or collect them too. Yeah, we know of many stationery addicts who hoard all kinds of pretty stationery and like be to surrounded by them. Available at Unfactory, we are in love with this quirky, pink pocketbook with a cracker design on the cover. 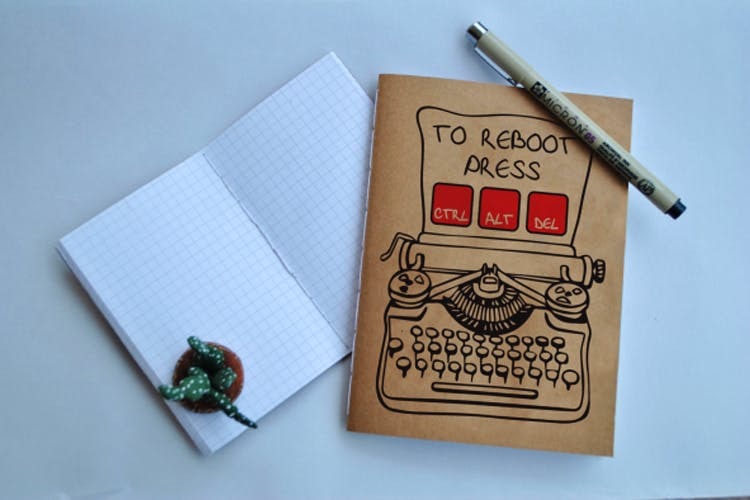 Even this notebook with a typewriter design is something we are heart. Thank you and best wishes cards along with the weekly planner cards should be part of everyone’s collection. You can check out their entire collection of stationery here. For those looking for gifting options, there’s stationery box sets too.